Play 6-7 practice games (from SEWA Darts) each and every week and add up your weekly totals from each one and compare against yourself with charts and graphs, but the key part is to compare your stats in each game to set number from a known skill level player. Maybe you think your scoring needs improving, but really it's your setup shots, or your doubles (I think we ALL need to get better there!! ), but if you focus on the areas where you are furthest away from the better player, then that brings you closer in skill level overall. Not saying to focus only on one thing, but less emphasis and more emphasis on certain parts. Now, you're not to do these sorts of things while you're playing, but during practice and just track things and then do the analysis afterwards. There are all sorts of drills you can do away from the tracking games that can help improve the specific items you're trying to work on: Grouping, Dart Math, Singles Accuracy, consistent release, Focus, etc. Then you apply those with the practice games. Then when you're playing in an actual match, the skills you've been practicing should manifest themselves. Play these games at least once a week and track the stats/progress. Start at 27 points, throw all 3 darts at each double 1->Bull. If you hit a double, add that double's value to your total for each you hit. If all 3 darts miss, subtract that double's value from your total. 3 for a triple, 2 for a double, 1 for a single. 2 for a double, 1 for a single. 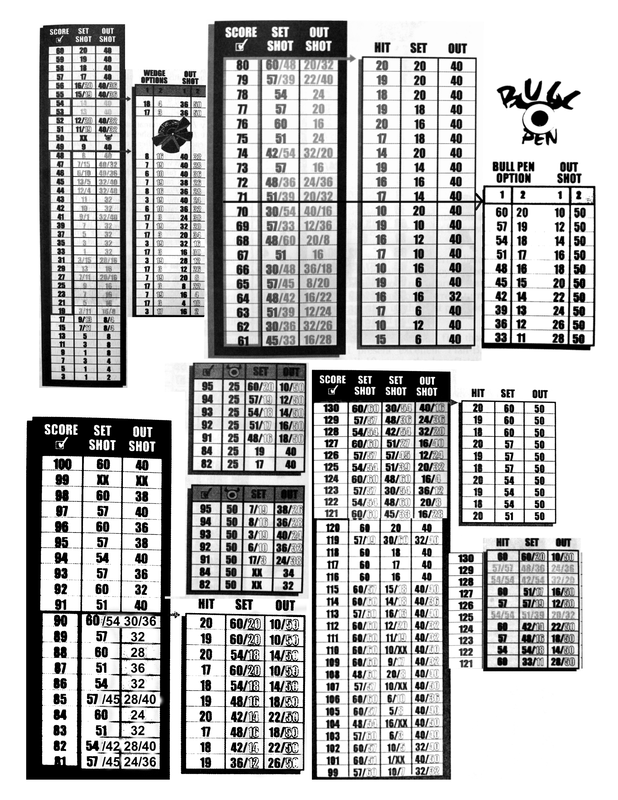 Go from 1->Bull and count the number of each number hit. Throw at each double, D1 to DB. Score 1 point for a hit. Score 2 points (instead) if it would have been a successful out - ie no 'scoring' dart before you hit the double. No penalty for missing a double. If you miss all three at one double, next round go to the next in order. If you hit the double before the third dart, move to the next number, in order, like RTW or Bob's. Do not throw at a double already hit. These are 'bonus' darts, if you hit the double, move one, if the turn ends without hitting the double, start on that same double on the next turn. If you hit enough doubles to have gone RTW before the 63 darts, continue around in order for a second time. Did you notice that playing legs of 501 wasn't in there?? That's applied practice, just like playing a casual round in golf, but that's not range time practice working on specifics. Here are some targets for a semi-decent player and for a World Class player you can use to determine where abouts you are. 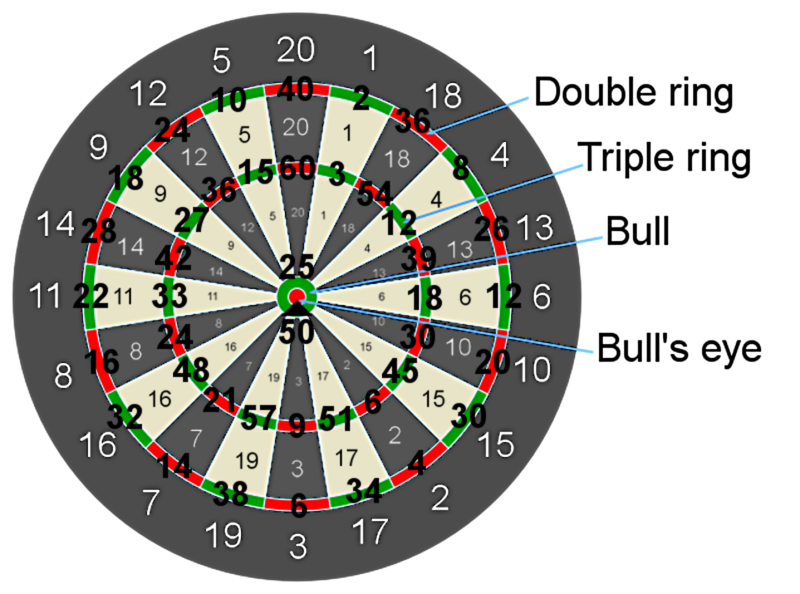 A different way of looking at the dartboard can also help when calculating outs. Outchart from 231-409 for those particular setup shots that are a little different. Must take "out" out in 9 darts or less. This can be a multi-player game as well, just take turns on the same "out"
If you fail to take the out "out" in 9 darts, suibtract 1 from the out you were on and start again. NOTE: Yes, you try and take 159, 162, 163, 165, 166, 168, 169, etc out, you have 9 darts to do it. Game ends when you finish all 3 darts in the single 20 bed. Count the number of turns it takes to go around the world. Lower the score the better. For advanced players, give this one a try. First two (2) darts must be at a scoring wedge (60, 57) AND you MUST hit one triple before shooting your 3rd dart at the double you are on.